Just by submitting a nomination you could WIN a four-night stay at Paperbark Camp, valued at over $3,000! Combining unique luxury tented accommodation with wonderful food and hospitality, Paperbark Camp is a peaceful bush retreat – think camping for grown ups! Earning an advanced accreditation from Ecotourism Australia, Paperbark Camp has solar-powered tents, successful re-vegetation projects, and a distinct lack of fences to help maintain the wildlife corridor. It was also highly commended in our 2013 Green Lifestyle Awards. The property has numerous hiking, biking and kayaking options, and the bird watching on site is spectacular. The four-night twin-share prize includes cooked-to-order breakfast daily, an in-room massage for two, complimentary dinner for two at The Gunyah Restaurant, and all the usual benefits that guests enjoy. Paperbark Camp is located in Jervis Bay, just over two hours drive from Sydney on the south coast of NSW. The prize is for up to two for a mid-week Bed & Breakfast stay out of peak season. This prize applies to readers only, not to businesses nominating themselves. The winner has 12 months to use their prize, and will be contacted via phone and email after 17 October, 2014. For more info, visit www.paperbarkcamp.com.au. 1. Information on how to enter and prizes form part of these Conditions of Entry. Registration for and/or participation in this competition is deemed acceptance of these Conditions of Entry. Acceptance of these Terms and Conditions is a condition of entry. 3. (i) Entry to this competition is open to Australian and New Zealand residents only. Employees of nextmedia are ineligible to enter. Nominations can be made by both the public and business owners. all nominations is free. All nominations must be for businesses, products, services and people that have been in operation in 2013/2014. 4. To enter the competition entrants must visit the Green Lifestyle Awards website, and fill in the entry form online with their personal information and the business/product information, including a selection of one of the 12 categories for entry. The entry will be submitted to the Green Lifestyle Awards. 5. Green Lifestyle and nextmedia reserve the right, at any time, to verify the validity of entries and entrants. Without limitation, entrants agree to provide identification to nextmedia upon request. Nextmedia’s decision in relation to all aspects of the promotion is final and no correspondence will be entered into. 6. Should entrants provide any photographs for the awards they must ensure the assignment of all copyright to Green Lifestyle and nextmedia. 7. By entering this competition you agree to receive the weekly Green Lifestyle newsletter. 8. By entering this competition, all readers who nominate a business, service or product will be entered in the running to win the prize of a four-night, mid-week, twin-share, Bed & Breakfast stay at Paperbark Camp, Jervis Bay, NSW, valued at $3,000. The prize includes a one-hour in-room massage for two and a complimentary dinner for two at The Gunyah Restaurant on site. The winner will need to arrange their own transport, and an appropriate time to stay with Paperbark Camp directly. The winner has 12 months to use their prize, and will be contacted via phone and email after 17 October, 2014. Businesses nominating themselves for a Green Lifestyle Award are not in the running for the prize. Entrants will be put through an initial screening based on their environmental and ethical principles. The resulting shortlist will be judged between 6 and 30 September 2014 by the panel of judges outlined on the Green Lifestyle Awards website and below. This is a contest of skill and chance plays no part in determining the winner. Each individual entry will be judged by the Judging Panel. The judges are seeking businesses, products and services that minimise their environmental footprint as much as possible. The judges will favour products/services/organisations acting on major environmental issues or with the potential to make larger cuts to people’s eco-footprints, or who have the greatest potential for direct or indirect influence, particularly in areas that are relatively un- engaged. The judges will also be looking for clear disclosure of commercial interests, funding sources, advertising or other conflicts of interests, particularly in the information sites category. In the people category, judges are seeking people who have made a significant impact in the green and/or community sector. The judges decision is final and cannot be appealed or contested. The Judging Panel consists of: Caitlin Howlett – Editor of Green Lifestyle; Karel Boele – director of EcoDirectory Australia; Matt Perry – Director of marketing and engagement at the Centre for Social Impact and the cofounder and partner of Republic of Everyone; Tanya Ha – environmentalist, author, science journalist, television presenter; Patrice Newell – biodynamic farmer and author; and Jon Dee – the founder of Do Something! and Planet Ark. One winner and one highly commended runner up will be announced for each sub-category at an industry event in Sydney on 16 October 2014. Winners and highly commended runners up will be announced on www.greenlifestylemag.com.au from 17 October and www.greenlifestylemag.com.au/greenawards from 20 October, 2014. 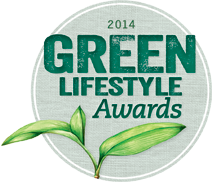 Winners and event photographs will be hosted on the Green Lifestyle Awards website until 2015. Event photographs will be made available from the Green Lifestyle Flickr site from 17 October 2014. Digital artwork will be available to winners and highly commended runners up from 17 October 2013, with permission to promote their award from this date.